Superman and friendly ghosts combine for slick and hilarious entertainment. Gainford Drama Club is playing its latest production ‘Laying the Ghost’ by Simon Williams to packed houses. 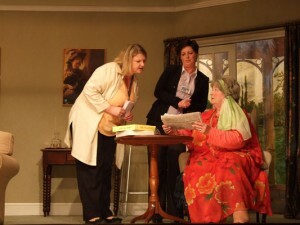 Set in a retirement home for actors, the play opens on the eccentric Freda Deacon, played superbly by Veronica Lowery, as she talks to friendly ghosts. The action centres on Margot Buchanan, played by Fiona Minay. As Margot celebrates her 70th birthday, she has three unwanted visitors who are all linked together starting with Sadie Croft, played by Anna Jones, her ex husband’s wife Lady Judy Buchanan, played by Iris Hillery, and to complete te line up, her ex husband Sir Leo Buchanan, played by Allan Jones. The fast paced first half ends with the death of Sir Leo Buchanan, leading to some great comic scenes, as he can now only be seen by Freda. 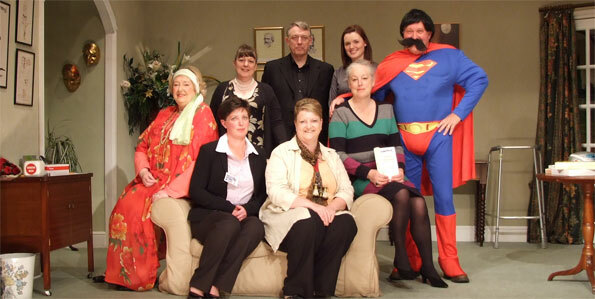 The cast is completed with Mrs Kidd,played by Kate Nichols and a Superman kissogram played by John Chadwick. With so many one-liners in this play the timing has to be just right to make it work, thankfully the whole cast had this down to perfection to create an incredibly slick and hilarious night’s entertainment.